Built in 1878, the Campbell Chapel AME Church is an example of Romanesque Revival architecture. It is a one-story, front-gabled structure that exhibits a straightforward and simple interpretation of the style. 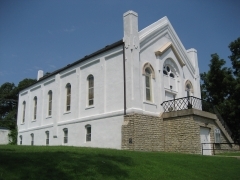 The building stands on an above-grade foundation and is situated on a bluff overlooking downtown Atchison. 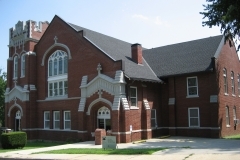 The building is nominated for its association with the growth and development of the local African American community and its architectural significance as an example of a Romanesque Revival-style church. 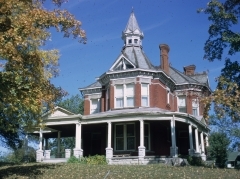 This late 19th-century farm located west of Atchison includes an Italianate-style residence and four outbuildings. Early 20th-century Colonial Revival updates include the replacement of the original porch. An Austrian immigrant, John Drimmel, Sr. established this farmstead in 1867, and the family maintained ownership for four generations. It is significant for its architecture. 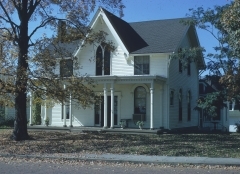 The Amelia Earhart Birthplace is a two-story, Gothic-style dwelling that overlooks the Missouri River. The house was built in 1861 by her grandfather, Alfred Otis. 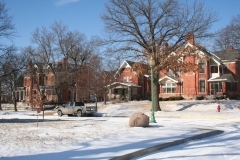 Amelia Earhart was born in the house in 1897 and remained in Atchison until the early 1900s. She became one of the first female aviators in this country while successfully completing solo flights across the Atlantic and Pacific Oceans. She mysteriously disappeared in 1937 in an attempt to circumnavigate the globe. The significance of the house is its association with Earhart. 115-125, 200-227, 302-315, 318, 324 2nd St., 203-305 North Ter, 124, 200, 300 3rd St., and 205, 112 and 224 Santa Fe St. Designed by Reverend William Smothers, construction on the Ebenezer Baptist Church began in 1911 and continued until 1923. This two-story brick building is an example of the Gothic Revival style, and it was nominated for its architectural significance. Constructed in 1879, the Edmiston House is a one-story Queen Anne-style cottage. It has an irregular roofline, ornamental wood siding, and decorative brackets that are typical of the style, which was popular in Kansas between 1880 and 1910. It was nominated for its architectural significance. The site of the 1949 Fox Theatre illustrates a long association with the motion picture business in Atchison; prior to the Fox, the parcel was the location of the Royal Theatre, subsequently known as the Fox Royal Theatre, from circa 1911 to 1947. 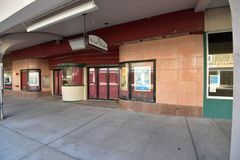 From 1949 to 2011, the nominated Fox Theatre operated as downtown Atchison’s neighborhood movie theater, serving a significant entertainment and recreation function in the city. Built in 1949, major interior alterations occurred in 1970 when the primary theater space was altered to create a separate theater in the balcony. Originally constructed in 1872, the Glancy/Pennell House was remodeled in the 1890s, doubling it in size and adding the Queen Anne styling. 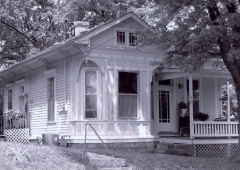 The home is a brick, two-and-a-half story structure. In its historic significance, the house reflects the prominence of two men of commerce in Atchison, Harvey M. Glancy and George Pennel. Built in 1873 by Governor George W. Glick, the Glick-Orr House was originally High Victorian Gothic in style. 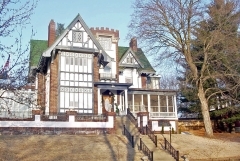 In 1913, two years after Glick's death, his daughter Jennie and her husband, James W. Orr, updated the property. Architect Louis Curtis from Kansas City, Missouri, redesigned the house to reflect the Tudor Revival style that incorporates half-timbering and stucco. 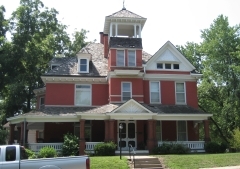 The Glick-Orr House is significant for its association with James Orr, who served as mayor of Atchison and in the Kansas House of Representatives. Built in 1886 for local businessman A.J. Harwi, this two-story red brick house has a unique octagonal cupola and exemplifies the late 19th century Victorian era. It is significant for its architecture and Harwi's contribution to Atchison's commercial history. He participated in Atchison's Exchange National Bank and owned a wholesale hardware business.